Duplex 2-in-1 Concentrate and 510 cartridge Vaporizer by Ooze is designed to handle all of your oil and concentrate needs. Ever wanted to be able to have a compact device that can serve multiple purposes? Well the Ooze Duplex Dual Extract Vaporizer Kit is just that! The Duplex Vaporizer has the ability to service just about any 510 threaded cartridge as well as your favorite concentrates. The Duplex has a built-in 1000mah lithium-ion battery which is very impressive for its size. The Duplex battery has variable voltage functionality which is cycled with 3 rapid clicks of the button. The 4 voltage settings are as follows Blue- 3.4V, Green- 3.6V, Orange- 3.8V, and Red- 4.0V. Another great function of the Duplex is the 15 Second Pre-Heat Function which is activated with 2 rapid clicks of the button. This is useful for those thicker oils or on a cold day when your material may need a little longer to heat up. The Duplex features a trigger style button on the side of the device. 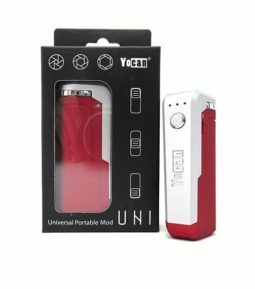 This also serves as a removable cover; once removed you will be able to charge the device via the micro-USB port at the base of the device as well as view the Voltage settings. Included with the kit is a Dual Quartz Concentrate atomizer which produces phenomenal flavor and massive vapor production. The Ooze also includes a 1ml 510 Ceramic Oil Cartridge which is perfect for vaping your favorite essential oils. The device supports any 510 threaded atomizer via magnetic connection. The Kit includes 2 different sized magnetic adapters, one for 1ml atomizers and one for 0.5ml atomizers. The Duplex 2-in-1 Concentrate and 510 Vaporizer by Ooze has an 11.5mm chamber opening which will support most of the 510 cartridges on the market. It will not however support the Cartisan Pegasus Cartridge which is the widest cartridge we have come across yet. It will however fit the Empty Ceramic Ccell 510 Cartridges and more normal size cartridges on the market. 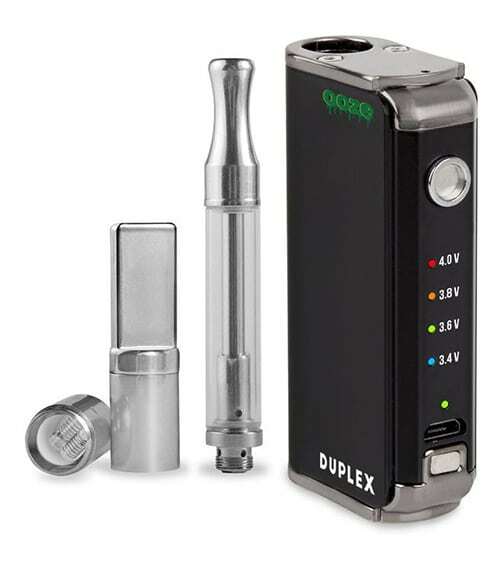 Overall, the Ooze Duplex Dual Extract Vaporizer Kit is an amazing multi-purpose device and great for any of you vapers who are always on the go!